If you’ve been planning on building a computer and you’re looking to choose the right PSU for your needs, one specification that you’ve likely come across is power supply modularity. But, what is a modular power supply? In this guide, we’ll quickly go over what it means to get a modular power supply and why they are typically better options than non-modular power supplies. In the grand scheme of things, building a computer isn’t that difficult of a task. However, there are nuances that can make building a given system a bit more difficult—and, this is especially true for first-time builders. One of the more common nuances of building a PC—again, especially for first-time builders—is getting cable management right. Good cable management starts well before you actually build your system. The more cable-management-friendly components you choose, the easier of a time you’ll have managing the cables in your system in an orderly fashion. The Corsair CX550 is a non-modular power supply. All of the cables come pre-connected to the PSU and cannot be removed. 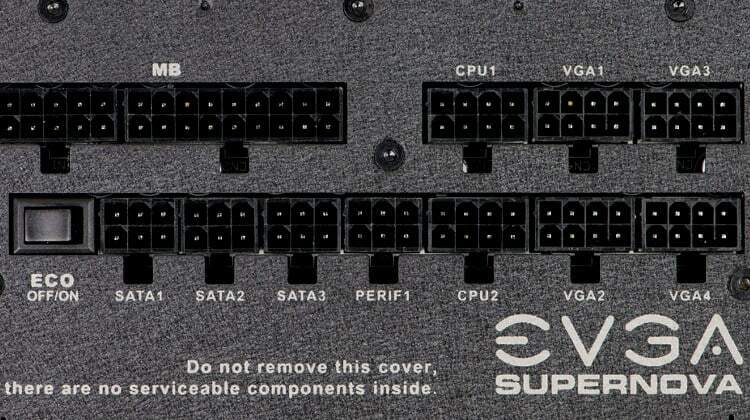 One component that isn’t always cable-management-friendly, is the power supply. Standard power supplies come with a big bundle of cables and not all of them are necessary to use in every system. And, depending on your computer’s case, you may have nowhere to hide those excess cables—which will make your system look messier than it has to. A modular power supply solves the problem of having excess cables in your case that will not be used in your system and are, therefore, just taking up space. A fully modular PSU is exactly what you think it is: every cable on the power supply can be removed. In a fully modular power supply, no cables come pre-connected giving you full control over your PSU’s cables. A semi-modular PSU offers modularity for the types of cables that aren’t used in every build. So, on a given semi-modular PSU, you might find that the main connectors (24-pin ATX, 4/8-pin CPU, and maybe PCIe) cannot be disconnected from the power supply, but other cables like SATA power and Molex cables are modular. The main idea behind a modular power supply is to remove cables that are unnecessary and that won’t be used in your build (mainly, extra SATA power cables and Molex cables). So, as semi-modular power supplies make the cables and connectors that aren’t always necessary optional to install, they eliminate the main problem that non-modular power supplies present. The Corsair CX550M is the same unit as the CX550 shown above, except that it is semi-modular. As you can see, there are still some cables that come pre-connected, but there are also ports for modularity as well. Semi-modular PSUs still have the main cables attached to the power supply—but since you have to use those main cables anyways, it doesn’t make sense to make them modular, right? And, if that’s the case, what is the point of a fully modular PSU? While semi-modular power supplies are good enough options for the majority of builders, they are limited in terms of customization. First, on a semi-modular PSU (and non-modular PSUs, too), the main cables that come attached have a fixed length that cannot be modified. So, one problem that can arise with semi-modular power supplies (and non-modular power supplies as well), is that the cables aren’t long enough to install in a way that keeps them hidden. An example of less-than-ideal cable management. While a modular PSU may not be the only thing this system needs, it would go a long way in helping reduce the amount of cable clutter in this system. What this means is that, depending on your power supply and computer case, a given cable on your PSU may not be long enough to route behind the back of the case to keep it hidden. And, if that’s the case, your only option may be to run the cable directly over your motherboard and other components or somewhere else where it is visible. While in most instances this isn’t an issue that will cause any major problems, it won’t look as clean. And, of course, a modular power supply can fix this issue, because if the provided cables aren’t long enough, you have the option to replace them with compatible cables that are long enough. The other area where fully modular power supplies help is in the option to use custom cables. One thing that I dislike about most power supplies is when the individual wires on a specific unit come with multi-colored plastic coverings. The multi-colored coverings on the individual wires on the EVGA W1 will stick out like a sore thumb in a nice-looking system. Imagine being a first-time builder and spending a lot of time choosing components that will look good together, only to gloss over the fact that power supply you have chosen has multi-colored plastic coverings on its individual wires and they stick out like a sore thumb. There are more and more power supplies that are transitioning from the multi-colored plastic coverings to all-black coverings. But, if you want to take it a step further, with a fully modular power supply, you can get custom cables in any color you choose. Reddit user u/lowfat32’s black and blue custom cables enhance the look of his system. So, if you have a specific color scheme for your build, a fully modular power supply with custom cables will allow you to enhance that color scheme rather than either hurting it (with multi-colored coverings) or not playing a role at all (black coverings). The obvious trade-off of a semi-modular power supply is that it doesn’t offer as many advanced customization options. And, the trade-off of fully modular power supplies is cost. If you’re building a budget-oriented system, the difference in price between a semi-modular power supply and a fully modular power supply could also be the difference between a higher-end graphics card or processor and a less powerful graphics card and processor. And, as those two components will have a bigger impact on your system’s performance, it would probably be a good idea to sacrifice full modularity so that you can use the extra money on the components that will actually deliver you more performance. Are There Any Scenarios Where A Non-Modular PSU Makes Sense? Non-modular power supplies aren’t useless. Their affordability makes them viable options for some builders. In fact, for anyone who is looking to put together an affordable gaming computer, a non-modular power supply might be your only option. Or, if you’re someone who just doesn’t care about what the inside of their system looks like, then a non-modular power supply is a perfectly suitable option. And, with the rise of power supply shrouds in modern computer cases, non-modular power supplies are becoming more viable in terms of aesthetics as well. PSU shrouds offer the ability to hide excess cables that aren’t used on a non-modular power supply. So, nowadays, with a budget-friendly case that has a PSU shroud (they do exist) and a more affordable non-modular power supply, you can build a pretty nice-looking system without having to drop a bunch of extra money on a modular power supply and custom cabling. Is A Modular Power Supply Right for You? There are many reasons why modular power supplies (both fully modular and semi-modular) make sense to use. Whether you just want to eliminate excess cables with a semi-modular power supply, or you want to use custom cables with a fully modular power supply, both options will make cable management much easier. So, whether or not a modular power supply is right for you really comes down to what your budget is and whether or not you could utilize the benefits that a modular power supply offers. Hey, I’m Brent. I’ve been building computers and writing about building computers for a long time. I’m an avid gamer and tech enthusiast, too. On TechGuided.com and the Tech Guided YouTube channel, I review PC hardware, peripherals, and various tech products to help you find the right product for your needs. Have a question? Just leave one below on any of the posts on the site. Safe CPU Temps: How Hot Should My CPU Be? SSD vs HDD for Gaming: Do SSDs Make Your Games Run Faster?